The other day I had a desire both not to cook in the house and to try something new. Well, new to me in the cooking department, at least. I grabbed a rack of pork ribs from the grocery store, threw them in a pre-made marinade, and chucked them on the grill. 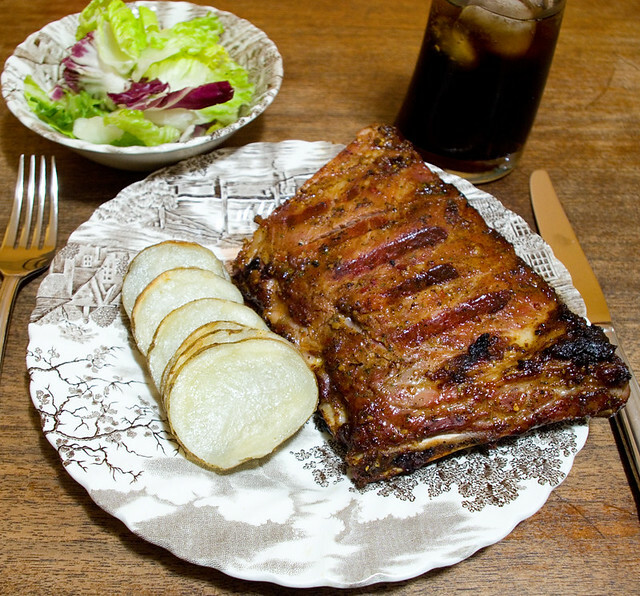 Although the meat was definitely edible, even tasty, I did discover that I had a lot to learn about cooking ribs because they ended up being rather chewy. When I’ve had ribs that other people have made, they always end up being fall-off-the-bone tender. I think I really needed to cook them low and slow to get that desired tenderness. Perhaps in a slow-cooker, or on a low setting on the smoker grill, once we get the auger fixed. Quick and dirty on the gas grill just isn’t going to cut it for the results that I’m looking for. As a side, I made foil packet potatoes with garlic butter on the barbecue. They don’t look like much, but they were cooked to perfection and were packed with flavour. As a veggie, we had a quick leafy salad. All in all, I would consider this dinner to be a provisional success. It wasn’t perfect, but everyone came back for seconds, and I learned something. It wasn’t bad for a first attempt, but I’m sure with practice I could do better.